There are many differences between personal training at home, bootcamp training with a personal trainer in the local park, personal training in a private personal training gym studio or a brand name health club or gym personal trainer. Personal training is the general term given to sessions run by qualified personal trainers for clients. Workouts can take place at a client's home or office, in the local park, at a local gym or pretty much anywhere else in between. Personal training at home is the most convenient for many people to workout with a personal trainer. You don't need to buy equipment, pay gym membership or even leave the comfort of own home. With home personal training your personal trainer will bring the gym to you, including free weights, stability balls, resistance bands, small hurdles and anything else that is lightweight and mobile. With home personal training your personal trainer can literally visit you at any time that best suits your lifestyle. So, if you'd prefer to workout at 6 am before workout, that's not a problem. If you'd prefer to work out after work, later in the evening or early on a weekend morning, again this is possible. Personal trainers who visit client's homes are very flexible and will aim to accommodate and work around the daily schedule of their clients. After all, this is their livelihood, so not many personal trainers will turn down good business. Home personal training sessions are best suited to busy people that will enjoy working out one-to-one with a personal trainer. 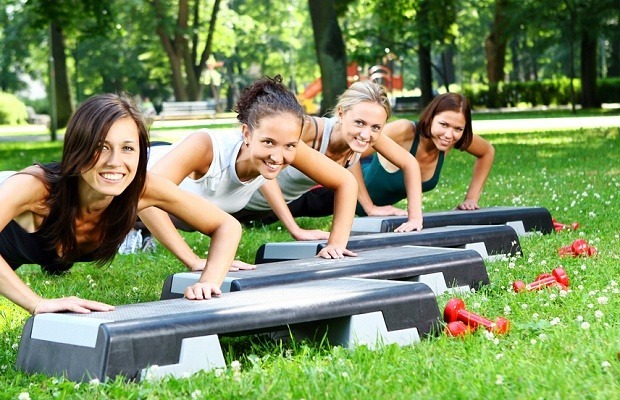 Bootcamp-style personal training is very different from any home-based personal training. In fact, in many cases bootcamp personal training isn't strictly personal training at all as most bootcamp workouts are run with numerous participants rather than just a single client with their personal trainer. Therefore, this is great for those people who'd prefer to workout alongside others in a fun, energetic social setting. Bootcamp personal training typically include sprints, hill runs, shuttles, lunges, squats, jumping, bounding, press ups, jumping jacks, bench step ups, tree presses, log lifts, heavy bag lifts, boxing with pads, pull ups ... in fact anything and everything that can build lean muscle tissue and burn as many calories as possible within 30 - 60 minutes. The equipment used in a bootcamp workout is minimal with many exercises based around body weight moves that tax the muscles of the legs, back, chest, arms and core, not to mention the heart and lungs. Bootcamp personal training is ideal for people who will enjoy working out with others and can commit to set times each week. Many large personal training companies are able to offer their personal training clients one-to-one workouts within a state of the art studio gym. Unlike a normal brand name health club or gym a personal training studio gym is never busy and when other people are present they are working with their own dedicated personal trainer too. The beauty of hiring a personal trainer with their own personal training studio gym is that you get the best of both worlds in terms access to regular gym equipment - free weights, resistance machines, rowers, stationary bikes, treadmills etc. - whilst still training in a personal space with a highly qualified personal trainer. Personal training with a gym studio is ideal for people who can afford that little bit extra for a one stop shop service that includes personal training, a gym experience and the luxury of not working out within a crowded environment. All brand name health clubs and gyms, including Fitness First, Virgin Active, David Lloyd, Total Fitness etc., all offer their health club members one-to-one personal training. Typically, health clubs employ three types of exercise professional; the group exercise class teacher, fitness instructors and personal trainers. It is the role of the group exercise instructor's to offer exercise classes in Body Pump, Body Attack, Spinning, Aerobics and more, whilst it is the fitness instructor's job to show first-time health club members around the gym whilst creating quite a generic exercise programme for them to follow. Whereas a health club personal trainer will be a qualified graduate from a personal training course or university with a Sports Science degree, who works in a one-to-one basis with a number of members who have sort personal training. Health club personal trainers are able to access the needs of a client, create a highly bespoke exercise programme for them, access their client's nutritional habits and impart advice about what to eat and when, as well as help and assist their clients reach their health and fitness goal as quickly as possible. Health club personal trainers like all other personal trainers, aim to teach their clients proper exercise technique as well as create a varying exercise programme that is both fun and effective. Personal training within a health club also has all the advantages that working out within a private personal training studio gym has; access to state-of-the-art equipment, as well as facilities like showers, steam rooms, and typically a swimming pool. However, depending on what time clients can train can seriously affect the way a health club personal training session is run. Normal peak times within any health club is 6 am until 9 am (the morning rush), 12 pm until 1pm (lunch time) and 5pm until 10 pm (after work), which mean that personal training at these times can mean waiting for machines, moving around to accommodate other members and generally be stared at when you are asked to perform an unusual (but highly effective) exercise by your personal trainer. Health club personal training is ideal for people who either live or work near a health club or gym as this can mean you can better pick and those which times best suit you, and more importantly, allow you to access the times that the gym floor isn't choc-a-block with other gym users.